I just got the platinum for World Seeker yesterday, so if you’re still on the fence about it give my review a read! Anyways, even having just finished that, this week we got an early chapter, so it’s time to cover it! I couldn’t help it- I just kept on chuckling. I know it just happens sometimes, people spend so much time talking on a singular subject- Sword are, after all, typically items of some degree of importance in One Piece -that you wind up using it in place of the word you were actually looking to use. I interpreted this chapter a bit differently, I’ve seen a lot of people say that this chapter shows Denjiro joined Orochi but I instead took this chapter to mean Kamazo ISN’T Denjiro at all. 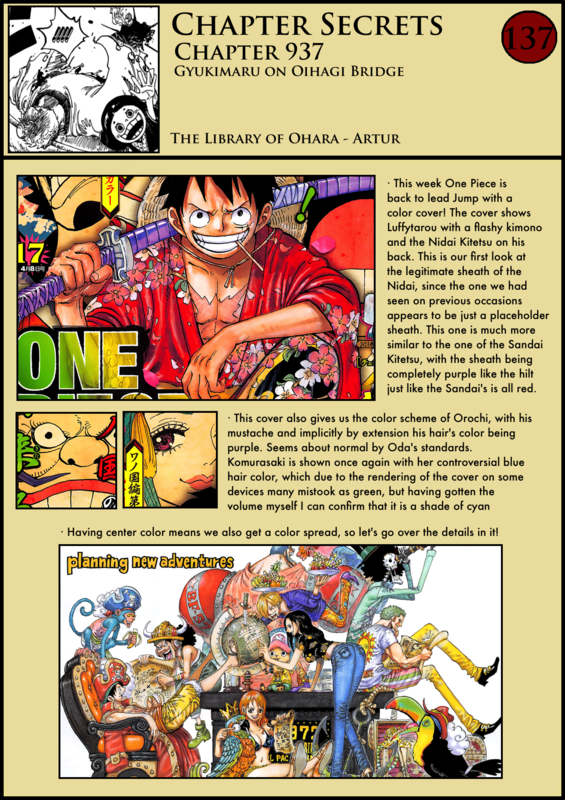 Essentially Oda mislead the fans into thinking he is but then revealed he’s Orochi’s servant. invisible suit of armour in other words iron ballon Big Mom. could this mean that she is using advanced armament? Or maybe it is kings haki related. my geuse is that she is an awakened kings haki user. If observation and armament has many levels then so does kings haki. I know that Oda confirmed it before, but I think that kings haki has an awakening that gives the user unreal power. it makes sense now how Big Mom was able to take down giants as a child. In the map Zoro is looking at, in the color page, it’s written “Enma” 閻魔. Which can be translated as “the devil” or “the ruler of Hades”. What about the fact that Komurasaki notices and takes regard of the fact that Zoro is using the three swords style? Could it be because she recognize him as one of the strawhats or because that style is somehow linked to Wano, further implying Zoro’s relationship with the country? 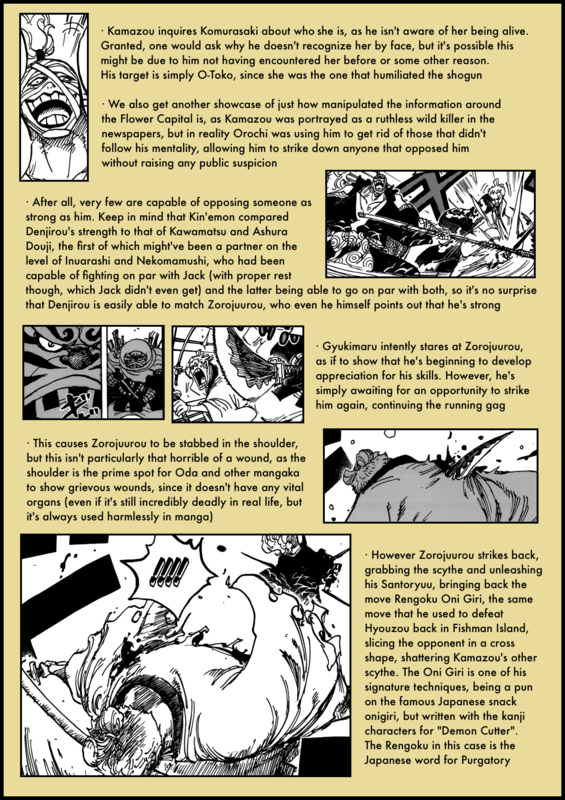 Senji89,, Komurasaki just suprised to see 3 swords style that Zoro had which never been someone used before in Wano. Nothing relationship between Zoro and the country, okay. After multiple times checking the look/appearances of Komurasaki and the woman in this chapter, I’m about 99% sure that they are not the same person. She is probably just another courtesan/geisha in the pleasure district and one kind and brave enough to look after Toko after Robin dropped her there. It’s possible that the woman herself offered the help in the first place. Not saying Komurasaki is dead or course. 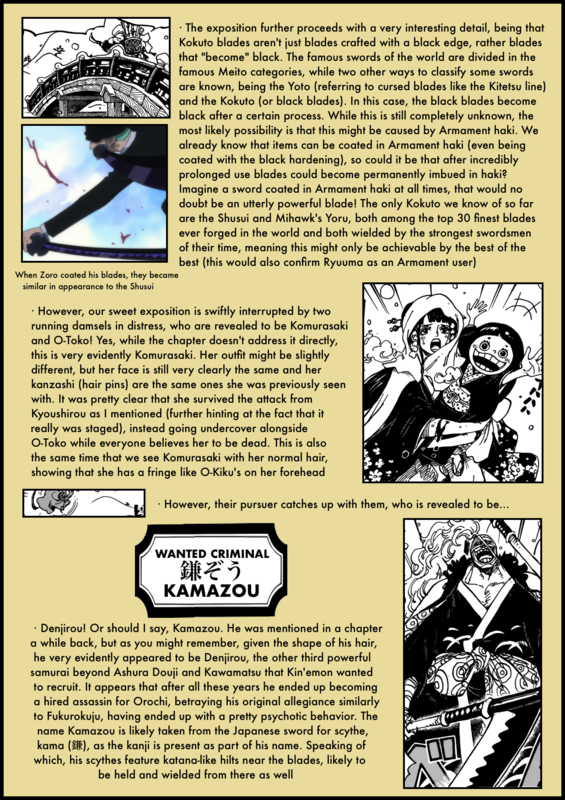 The theory that she and Kyoshiro staged the incident could be true. Is my comment from earlier deleted somehow? can we ask permission to translate this deep analysis to our language and post on Youtube? 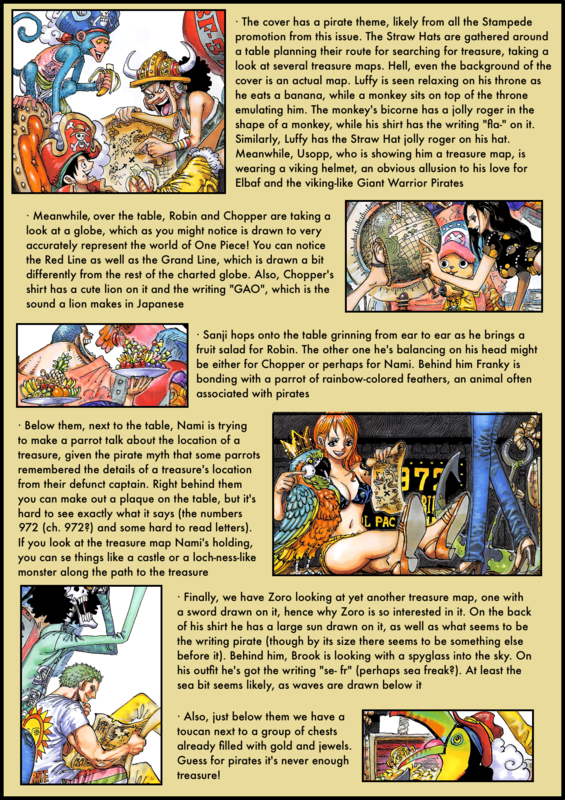 we will put this website link in our description..
Notice how Zoro’s face was hidden again?? Perhaps the eye was open! 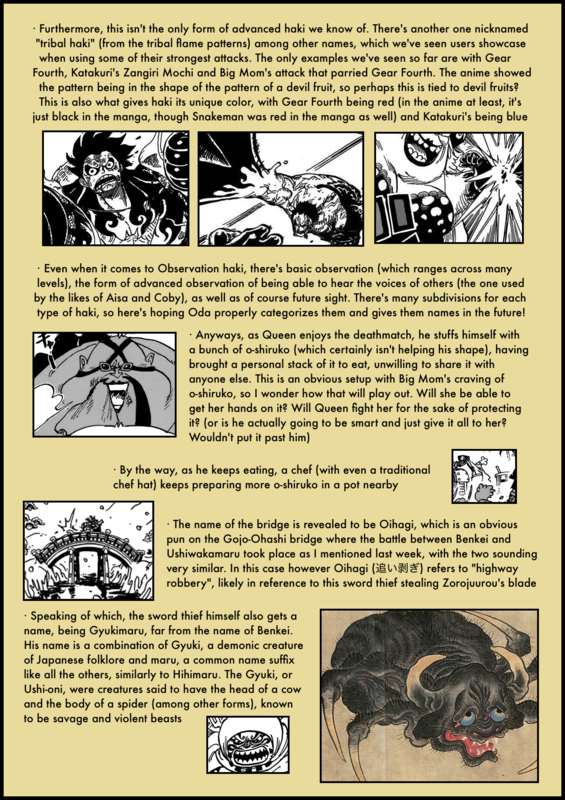 Kaido vs Luffy PART 2. Kaidos club made of seastone. the first person we saw in the series who had a similar weapon to that of Kaido was Alvida. In fact when alvida hits Luffy with same kind of club Luffy is just fine and sends her flying instead. Plus Luffy is immune to physicle attacks. Luffy got puntured like a baloon when he fought Kaido and forced out of gear fourth. there is only one thing can do that and that is seastone. Katkuri tries a similar attack in ch 895 with haki and he fails to knock out Luffy of gear fourt, Luffy got back up. Kaidos attack is not more impactfull as Katakuris was. Proof, look at the hole on the ground, it´s very big. 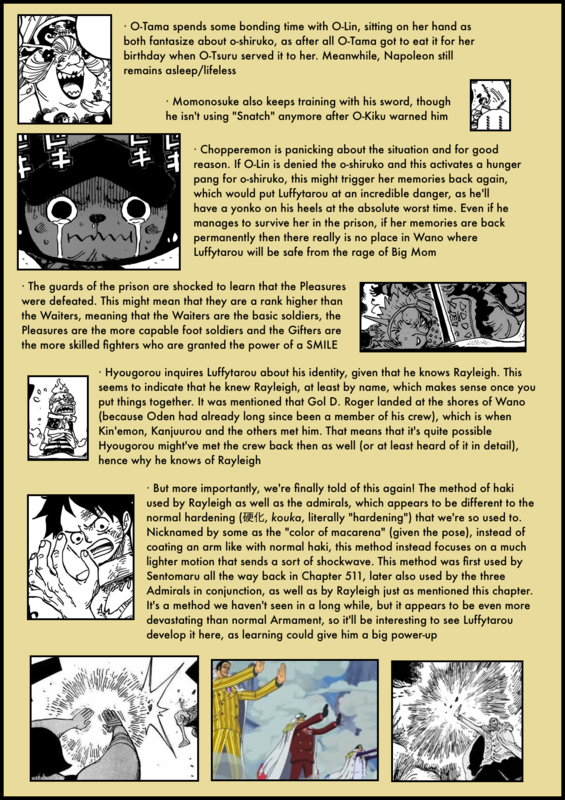 That hole on the ground in ch 895 is as big as the hole that Kaido climbed up when his introduction was made. 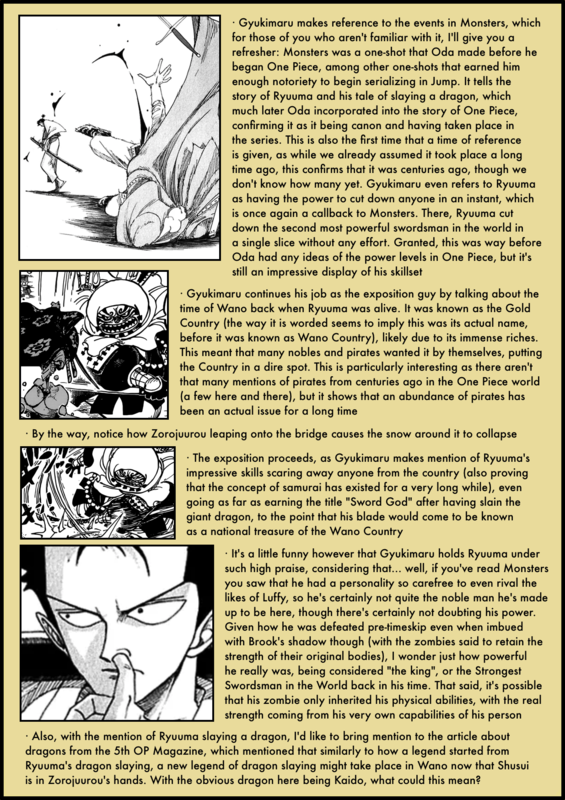 Conlusion, it makes only sense if Kaidos club is made of seastone otherrwise Luffy would´nt get one shoted. Who says Kamazou is Denjiro..it never confirmed yet.. I dont think he is the one as weii. This guy Kamazou is very bad person actually doesnt give anyone heart like Kawamatsu or Doji. I think i get it who’s actually Denjiro is and that’s connected how Komurasaki still being alive and Toko get escaped from the town..
Random Folder, you’re an idiot, because they didnt use haki.